Once Upon A Time premiered on October 23, 2011 and has an upcoming fourth season airing September 28, 2014; season one through three contains 22 episodes. This hit series is imagined by Adam Horowitz and Edward Kitsis. All of the series’ characters have two identities: one is a Storybrooke name and the other is an equivalent fairytale name. Main characters are played by Ginnifer Goodwin (Snow White and Mary Margaret Blanchard), Jennifer Mornson (Emma Swan), Lana Parrilla (Evil Queen and Regina Mills) and Josh Dallas (Prince Charming and David Nolan). These characters are the first ones to appear and plant the foundation for action and adventure in the show. One cannot be ashamed to admit an addiction for unique fantasy. Most of the universe’s most brilliant and memorable people are a bit mad, or else what will make their actions and lives unique. Action adventures shows are more common and are usually a bore based on my perspective and dislike for sci-fi movies. Well this particular show is unexpectedly marvelous plus more…brilliant and magical. The never-ending sword battles, mystic feuds, strong royalties and budding romances delivers an experience that is a zillion times better than the traditional fairytale. Just SPELL-BINDING! Horowitz and Kitsis include gritty twist that always leaves their viewers drooling for more. Especially for those 4 a.m. night dreamers, like myself, that will kill for a great story line. I, along with other reviewers, definitely fall into the writer’s lap and after every episode I desire more like a child in a candy store; I am most certainly a pawn in the enticing plot line’s trap. To make matters more attractive, these producers include a clue in the intro logo of what to expect from a specific episode. In the “Once Upon A Time” picture (shown above), there will be an important thing or person that the episode will revolve around. For instance, if the episode will be about Captain Hook (one of the many fictional characters in traditional fairytales) needing his boat to resolve a complicated conflict, there will be the dawning of an eerie pirate ship in the forest (display picture). Upon seeing the clue, exhilaration runs through my veins like heroin in a needle and the excitement sends chill down my bare back. How splendid it feels to binge-watch! 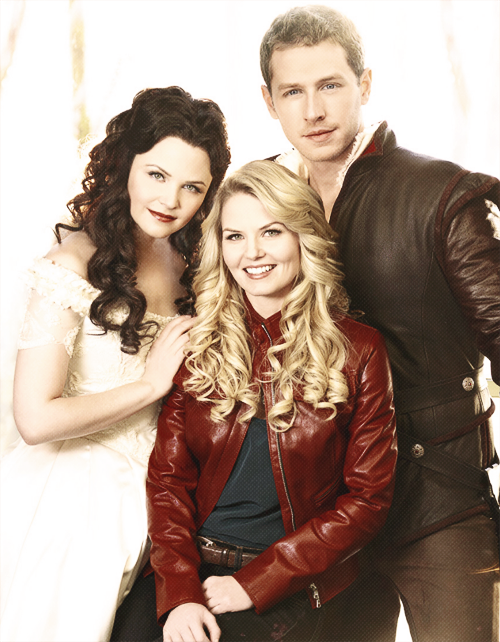 Once Upon A Time is considered an American fantasy drama series. The show begins in a fictional Maine town called Storybrooke. The inhabitants of this little town are completely oblivious to their true mystical identities; they blindly follow Regina who is the Evil Queen in the Enchanted Forest, but since all previous identities are forgotten she is seen as the powerful ruling mayor in Storybrooke, Maine.. All the citizens, including Regina, are from the “Enchanted Forest” where everything was created and altered by magic but Regina (Evil Queen) reined the land. In Regina’s child to early adult years she is neither the queen nor is she evil. Regina’s mother, Cora, manipulates Snow White by using her as a factor in the devious plan to become a wealth grandmother through marriage between Regina and the King who is Snow White’s father. This arrangement would’ve been perfect for a gold-digging female with no desire of one true love, but Regina’s heart is already taken by the poor stable boy. Like any selfish mother, Cora does not like the idea of her daughter marrying a penniless peasant. Snow White, being a common gullible and untrustworthy child, reveals Regina’s secret lover to Cora who proceeds to rip out the lover’s heart and “blesses” Regina with the pleasure of watching attentively. Regina’s heart becomes black as she marries the King and forever carries hatred in her soul for Snow White. Regina goes on to terrorizing the entire kingdom which gives her the name “The Evil Queen”. Living in the expectation of being evil, Regina decides to ultimately cast an unholy curse called “The Dark Curse” over the kingdom so that she will be the only person with a ‘happily ever after’ life. This curse succeeds until the Savior, Emma Swan (daughter of Snow White and Prince Charming), is summoned to Storybrooke to break the curse. There is a never-ending battle for the chance of true love and control of power portrayed by the characters. The beginning brilliantly gets to the heart of the plot without revealing all of its juicy layers. This series is a mystery that leaves viewers exclaiming “ohh” and “ahh” due to the unexpected twist and turns. Going beyond the plot, the actors and actresses perform with such a tremendous amount of passion that it is difficult not to believe they aren’t truly a blood-related family. The tension between the Evil Queen and other characters feels so realistic that it can be sensed through the screen. It is hard to imagine that all the characters may actually get along offset in real life. The jump back and forth between worlds, Storybrooke and Enchanted Forest, gives the perfect amount of clarification the viewer can appreciate because helps keep up with all of the events. Every aspect in this show, ranging from character to simple object to conflict, connects in some way; whether it is a simple cracked cup or a magical mirror. I know for sure that this show couldn’t have been created better than this.